Every once in a while there are those days when everything you planned kind of goes out the window. The concept you thought they “got”, they really don’t have. The practice you thought had been “enough”, really just skimmed the surface. Moving on just isn’t going to work out. This week I had one of those days. I realized that we were going to need to spend a LOT more time on parts of speech and that all the work we had done previously hadn’t been enough to cement the concept. So I dumped my plans rearranged a few things and we made little books. Then, we took some notes. We simply created a whole interactive notebook on the fly! Completing these books helped the kiddos truly grasp the concepts. EVERYTHING in them was done by them. Even the construction of the books! These are quick and easy to make, don’t need any stapling, and hold together perfectly. Start with a piece of 8 1/2 x 11 paper and scissors. Fold that paper in half twice… along the 8 1/2 x 11 side. Then fold the whole thing in half the other direction. Unfold so it is only in half – the first fold you made – then look of the fold line that goes from the center to the fold line. I’ve highlighted it green here. Cut that line. Stop at the fold. Open it up and fold in half lengthwise. Begin to push the two sides toward each other and your book will start to fold itself! Its ready to use for anything you wish. This works at any grade level for any subject! And that’s it. You can use these little books for just about anything. You can glue in little images. Journal about math. They are great for a “show what you know” assessment activity. The more you do it, the quicker your kiddos will be at creating them. With my firsties, I had to fold the paper for them the first few times we’ve made these so they can see where the fold lines are. Now they can follow along folding while I show them each step and often make their own books during word work or free choice! I’m all about keeping it simple and quick! For more bright ideas, visit the links below!! 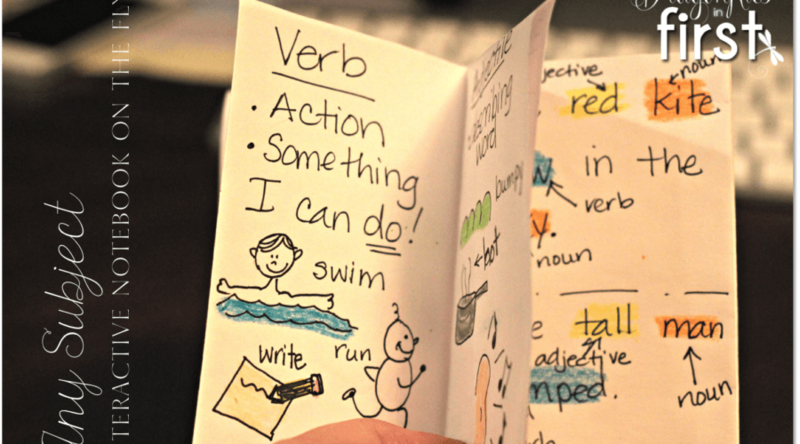 I've made those books before, but never thought to use them as interactive notebooks! How clever! What a great idea! Thanks so much for sharing this. I can't wait to try it.